Eclipse Sql Explorer is a thin Sql client that allows you to query and browse any JDBC compliant database. It supports plugins with specialized functionality for individual databases (Oracle, DB2 and MySQL) and can be extended to include specialized support for other databases. Complete all-in-one web code editor for all your web document editing needs. SQL Admin Studio is a complete Database Management & Design Environment for SQL Server, MSDE, Express, Access & MySQL. Schema Explorer, Backup & Restore, Query Designer, Full Display Script Editor with Syntax Highlighting, Table Designer and more. Sql Admin Studio is a complete Database Management & Design Environment for Sql Server, MSDE, Express, Access & MySQL. 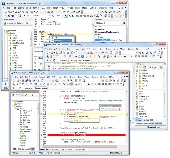 Features â€“ Schema Explorer, Backup & Restore, Query Designer, Full Display Script Editor with Syntax Highlighting, Intellisense, Table Designer, Code Templates, Indexes, Constraints, Foreign Keys and more. EMS SQL Manager Lite for PostgreSQL is a light and easy-to-use freeware graphical tool for PostgreSQL administration. It has minimal required set of instruments for those users who are new to PostgreSQL server and need only its basic functionality. SQL Sentry Plan Explorer is a FREE tool that builds upon the graphical plan view in SQL Server Management Studio (SSMS) to make query plan analysis more efficient. It is a lightweight standalone app that contains many of the plan analysis features introduced in Sql Sentry v6. It does not require a collector service or database.